.. after a few hiccups during the long weekend, i have a few exquisite yarns ready for a peek over at flickr..
Eucalypt and Bluegum are part of a series inspired by the beautiful landscape of Australia, and the walks i take with my children through the bush in the Blue Mountains. They are home grown fleece, handdyed, carded & sculpted on my wheel for softness and presence, finished with handfelted gum-leaf forms which will adorn the knitted fabric with a sense of natural beauty. Bright City Lights is a candly-stripe singles spun from a gorgeous batt from fellow etsy seller Loop. this skein is woollen spun with loads of alpaca and other fibery goodness for which her batts are reknown. Ice Queen holds her presence beautifully with a smooth sculptural drape from my own blended Botanica Batts: ingeo corn, tencel, bamboo, soy silk and sparkles with irridescent tinsel. Mermaid's Tail (currently NFS) - soft, lofty wool & silk fibers selected for colour & texture went into 2 batts, once drum carded for maximum textural fullness. 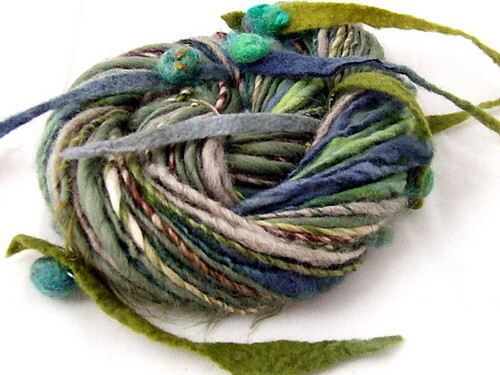 Handspun quickly with random slubs & spiral plied with coils, highlighted with a strand of seaweed cocoons. 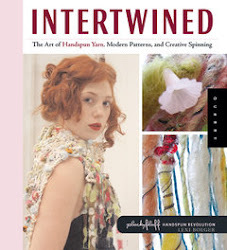 Contains merino, mohair, recycled throwsters silk, glitz, angelina, doe locks and silk cocoons.